Furniture in the 18th century is very different than the ones we have today. For example, furniture in those days was typically very ornate. The furnishings were more like pieces of art and were a symbol of class and status. Because of this, furniture makers and craftsmen during the 18th century were less interested in functionality and comfort and, thus, they were more interested in style and what was aesthetically pleasing to the eye. People of significant wealth were typically the only ones who could afford to buy what was considered a luxury. This furniture could be trimmed in gold, have expensive fabric to cover the cushions, and have intricate artwork carved in the wood. And so it was that in the 1700s that items made by the master craftsmen were costly and out of reach for most people. Those who did not have much wealth did have furniture but they usually had to find ways to make the items themselves. Since fine cloth and rare types of wood were much harder to obtain in those days, the average person would usually craft subtle and functional seating and beds for their homes. During the 19th century, there was a shift in the intention of chairs, sofas and other items in the home. That is that they started to become more functional and more affordable. It became common for people to be able to purchase items that maybe weren’t so ornate but still nicely made. You can contribute a lot of this paradigm shift to the Industrial Revolution. Thanks to the advances in technology that came with this time period, furniture manufacturers were able to mass-produce items and effectively lower the cost of their products. If it weren’t for this advancement, then we wouldn’t have all the comfortable pieces that we enjoy around our house today. Furniture is something that we may take for granted, so it is fascinating to consider that people only a century ago didn’t enjoy the same luxuries of nice furniture that we have today. For this reason, the Industrial Revolution is one of those significant watershed moments that really helped to establish the way of life that we enjoy today. Even for people who are purchasing handcrafted furnishings, custom made pieces, or other unique creations, craftsmen have the capability to produce them so much faster due to power tools and other advanced machinery that was not available in the past. At Santa Fe Terra Western Furniture, we celebrate that anyone can afford to own and enjoy the luxury their own home furnishings. It is our passion to make people happy by helping them outfit their homes with our furniture that they will enjoy for years to come. 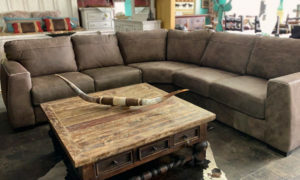 We pride ourselves on having a vast selection of rustic, distressed, western, and hacienda style items. From imported and custom decor to furniture sets for sale, you can find that piece that ties your room together!